Unfortunately, I have seen now on several days a severe cruelty taking place against wild Iguanas right in the center of Punda. 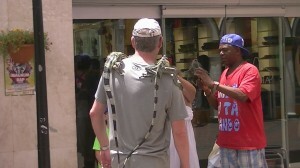 Everyone to whom I spoke to seems to be very disgusted and annoyed by seeing this guy running around with at least two Iguanas in very worry some conditions trying to make money by offering those tortured creatures for a photo shoot. Aren't these animals protected in Curacao? Isn't there anyone who stops this cruelty? That those two animals (and most likely others) are victims of starvation is even on the photo I took very clear to see. The guy is starving those animals. He doesn't feed nor water them. The two I saw (photo taken last Friday) were highly stressed and very weak. One of them most likely already in the process of dying. It seems that those animals in their abused stadium are, so to say, behaving "ideally" for their job showing no self controlled will anymore at all. By today the guy had exchanged one of them and his previous victim most likely disposed by just simply throwing it away as might have been many others too. The poor creature on the tourist's left shoulder was already in such a bad shape that it couldn't fulfill any longer its instinct fear behavior bewaring it from falling down in such situations. It couldn't hold itself anymore it just laid up there having no energy anymore to hold itself, I assume it was already in the process of dying. The creature to the right also in bad shape, but still had it's fear awareness function at least partially active and is pressing its tail against the tourists back to balance out the insecure position it has to endure and is also visible using its nails to hold himself out of fear to fall down. This guy is abusing these animals in broad daylight. And as he is readily able to exchange a dying one against a new one. He must have some creatures caged at home. One thing for sure, this isn't a tourist attraction at all! And I herewith call on you to do your very best to help stop this cruelty against wild animals who can't defend themselves.